You've just won an award. Hey, it doesn't get any easier than this! 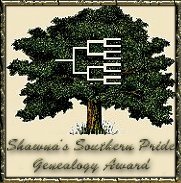 This is for anyone with a family-friendly genealogy page whose roots & relatives are mainly from the south and who takes pride in his or her southern heritage. Right-click your mouse over the award and save it to your disk or hard-drive or I can send it to you via e-mail. Please do not link to the image file on this page. If you take an award to display on your page, please e-mail me and tell me the URL of your site (for no other reason than that I love to look at new sites) and place a link to my page on yours (http://www.shahall.com). Take the award and show your southern pride! Mt. View Research - Page Co., Va.